I knew that I was going to have challenges in my weight loss journey post-surgery. I knew that it would take time for my body to adjust to the new hormones. I knew I might gain. I knew getting back into fitness would be a struggle. I knew all of these things, prepared myself for their reality but still find myself crumpling with despair over them. I know many who are in the midst of using different weight loss programs. One lost like 50 lbs in like 20 weeks doing Medifast. My colleague is using Slimgenics. She has lost about 17 lbs in 8 weeks. My jealousy? Immeasurable. However... I have done these other programs before. I have lost weight. I also gained it all back and then some. Many of them have added on maintenance programs since my day of trying them, but I still stand by my decision to lose weight through diet and exercise. Despite my slow weight loss, I know Weight Watchers is the right program for me. It is teaching me how to make the right food choices out of my own cupboard as well as in my everyday situations. Probably the best part is that nothing is truly off limits. You just learn to be accountable for it. I had my cholesterol checked this past Friday for the first time in probably a decade. I wasn't entirely surprised that it was borderline high given our frequent trips to Buffalo Wild Wings over the course of the last few months (it's Jack's favorite restaurant in the whole world); however, I was bothered by the numbers. It was the first bit of definitive proof of how important it is for me to lose the weight and probably the biggest motivator I've had in this journey thus far. I need to be around for my family. Despite my recent struggles, I continue to go to my Weight Watchers meetings to weigh in and get the support I need every week. Yes, my heart sinks when I see the numbers going up and down and essentially nowhere, but I am THERE and that is half the battle. I remind myself that from the point I had my baby until now, I've lost 50 pounds and 20 since I started WeightWatchers this year. That is something to be proud of. Our homework last week was to set one attainable goal for the week that has nothing to do with the number on the scale- one thing that will aid my healthiness journey that I struggle with. My goal was to track my food every day. Every Thursday following my meeting, I am always inspired but conveniently forget to track on the weekend. As connected as I am with an iPhone, iPad and laptop you wouldn't think this would be so hard! So no more excuses. I'm going to track everything I eat from here on out. Interesting, yes? 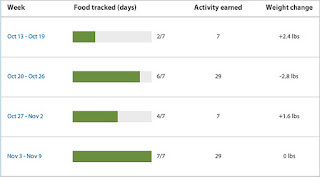 When I earn consistent activity points combined with food tracking I lose more weight. While I stayed steady this week, I didn't gain and I am okay with that. Time to stop thinking I can do it without the tracking. Tracking works and this is PROOF. Coincidence? I think not! I'm going to continue to be diligent in my tracking efforts this week and we'll see if this trend continues. My additional goal for the week is to DRINK MORE WATER and more closely monitor my diet other than just tracking points. A year from now, I desperately want to be able to go back to my doctor at my goal weight and find that my cholesterol is in the normal range. What healthy goals are you going to set for the week? Motivation Monday Shocker: Exercising Feels Good!